Tonight Nashville's minor league team, The Nashville Sounds, play their final game at Greer stadium, home to the team since 1978. In 2008 it was my honor to make an appearance at the game alongside my nurse assistant, Nurse Moan-eek. We signed autographs, Moan-eek led the crowd in the 7th inning streth rendition of "Take Me Out to the Ballgame", and I got to throw out the first pitch at the game. In honor of the final game at greer (barring a playoff appearance) I thought it appropriate to post the pitch here on the blog. Next year the Sounds move into a brand sparkly new stadium... truly the end of an era in nashville. 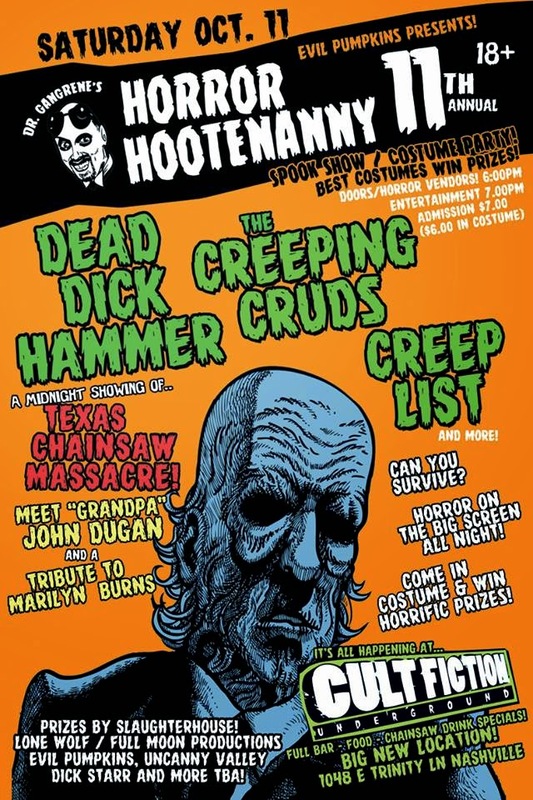 The details for the 11th annual Dr. Gangrene's Horror Hootenanny are officially announced, and we're excited to announce a new venue this year, as well as a slightly different format. This year we'll be showcasing 3 bands early on in the evening, with a special 40th anniversary/Marilyn Burns tribute screening of Texas Chainsaw Massacre at Midnight, with special guest John GRANDPA Dugan. As always the event is a costume party, with special prizes for winners, plus a dollar discount at the door for all who come dressed in costume. 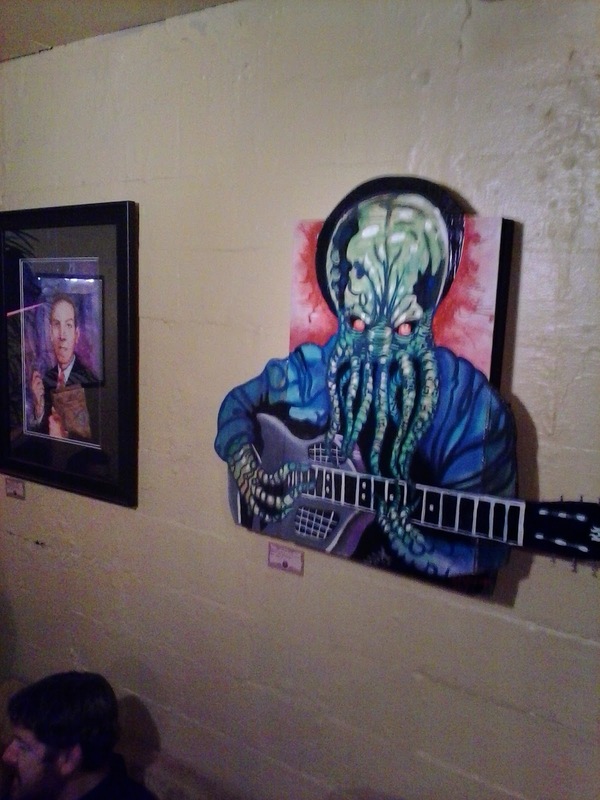 There are 2 separate areas at the new venue, the CULT FICTION UNDERGROUND. One is the screening room where the bands will play and the movie at midnight. The other room is the bar area where the Halloween party will rage until the wee hours of the morning. 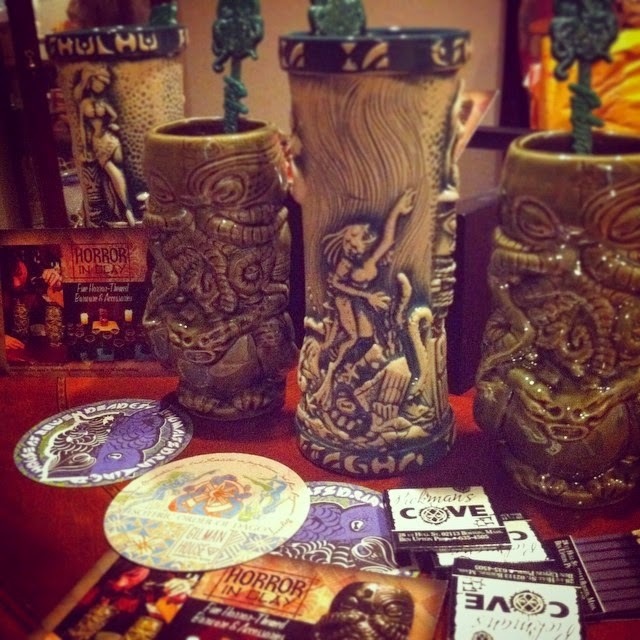 The Horror Hootenanny has been howling for over a decade - this is the eleventh annual Hootenanny, Nashville's premiere Halloween event. make plans now - it's gonna be a scream! In this episode we take a look at 2 Price films from 1945, A Royal Scandal and Wilson. H.P. 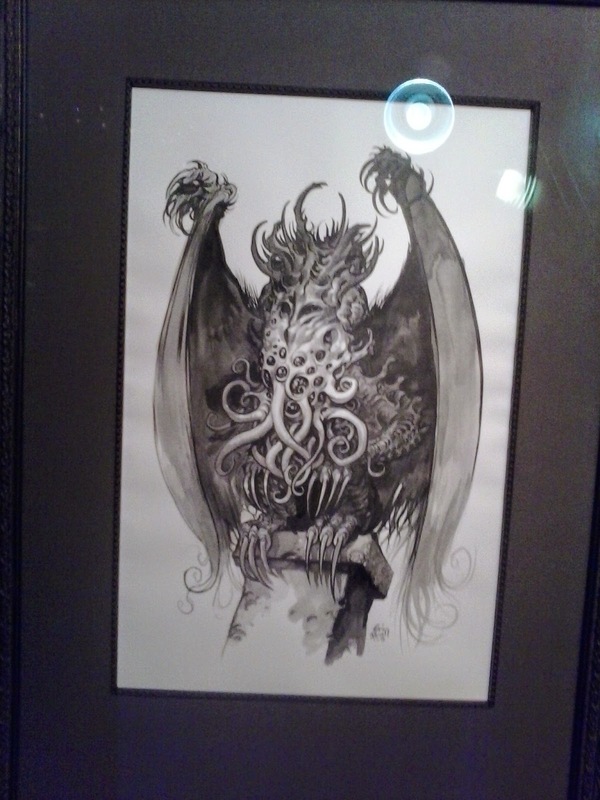 LOVECRAFT ART SHOW - Cthulhu Calling 3! 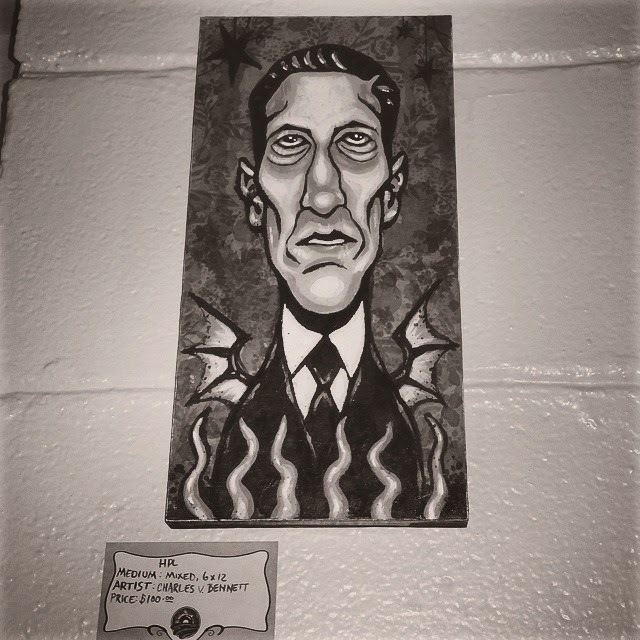 August 20th marks the birthday of horror writer Howard Phillips Lovecraft, whose Cthulu mythos and cosmic terrors continue to inspire to a legion of writers, artists, filmmakers and more to this very day. 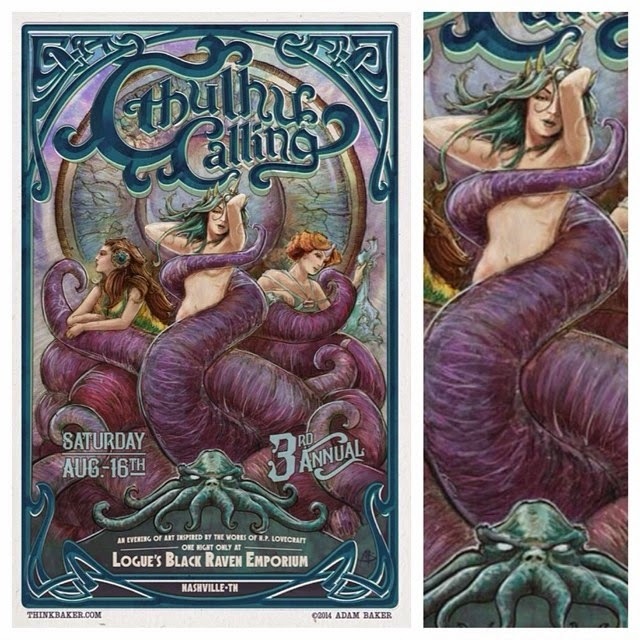 Case in point was a cool event I attended last weekend at the Cult Fiction Underground lounge in Nashville, TN - CTHULHU CALLING 3. 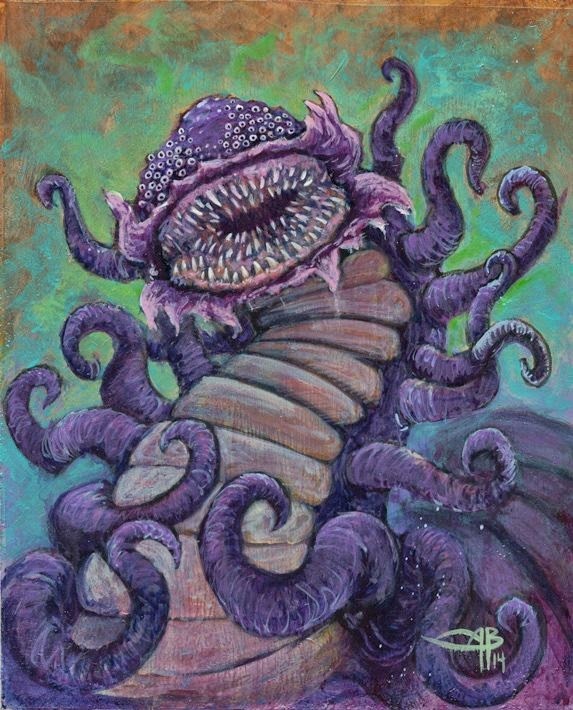 Yes, the influence of the elder Gods even reaches into the heart of the bible belt!! This final piece is from my good friend Eric Powell, comic artist/writer extraordinaire and creator of The Goon. 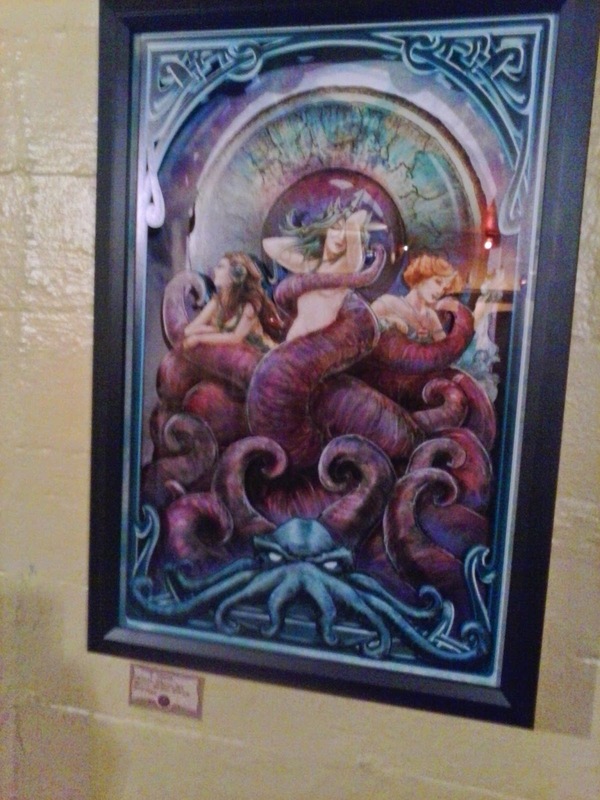 The event is organized by Adam Baker, Cthulhu enthusiast and the fella responsible for the awesome King in Yellow piece above, as well as the trio of tentacled ladies piece that was used in the advertisement. 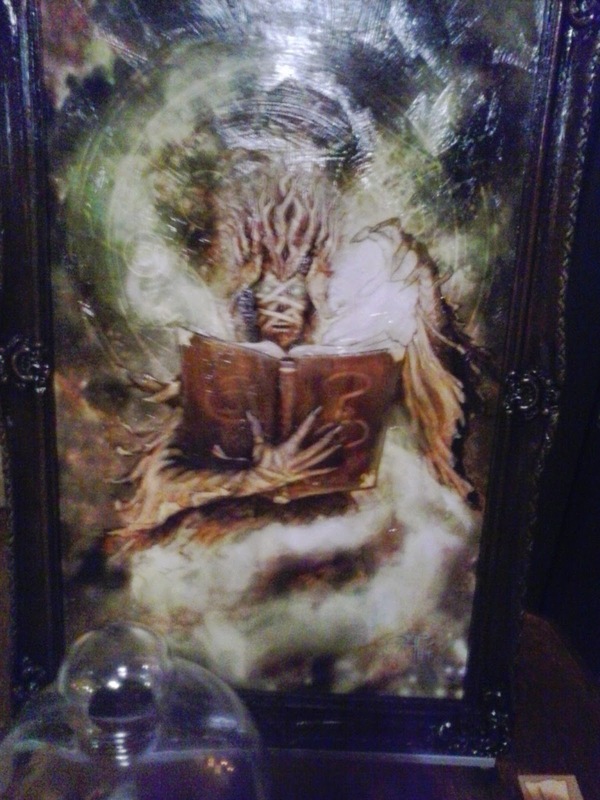 Amazing work as always, Adam! 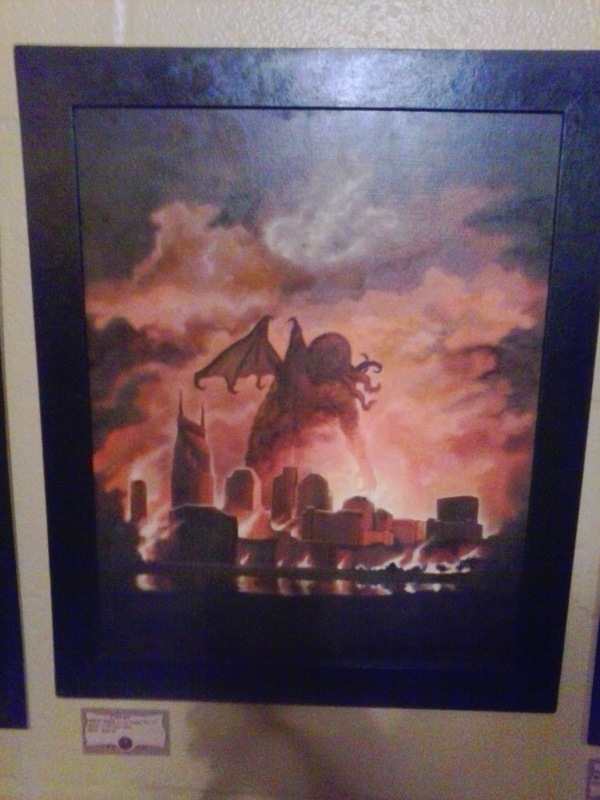 Thanks for organizing this monstrous event from the stygian depths of Music City! Ok, sometimes late is better than never, I suppose. Almost exactly one year ago I received a screener copy of Crystal Lake Memories, a 2-DVD documentary on the Friday the 13th film series from 1428 Films and Panic Ventures. I started watching it last year but got completely caught up in the Halloween hullabaloo (my Octobers are always insane), and I meant to revisit it several times since. Just recently my son Luke and I sat down and watched both discs and I immediately regretted waiting so long to do so - this thing is fantastic! And not just for fans of the Friday franchise – those folks will obviously enjoy it. I’d recommend this for the casual Friday fan or even anyone who simply enjoys documentaries in general. First off, this is a massive documentary. It is a visual counterpart to the 2005 book by Peter M. Bracke, and covers the entire franchise from the original 1980 film by director Sean S. Cunningham all the way through to the 2009 remake, including the 1987 TV series. It features interviews, clips, and commentaries from almost everyone that took part in those films; actors, directors, writers, stunt men, producers, casting agents, composers – you name it, they’re probably in there somewhere - even Alice Cooper! Crystal Lake Memories opens (and closes) with a brand new sequence shot specifically for the documentary, featuring a group of kids (ok, not so much kids as twenty-somethings… or thirty-somethings, but who’s counting?) huddled around a campfire being told the legend of Jason Vorhees by none other than, appropriately enough, Corey Feldman (who plays a significant part in the Friday series). This then dissolves into the title sequence where the moon morphs into Jason’s signature hockey mask – and the show is on! We are led through the series film by film in chronological order with Feldman’s narration and a host of interviews and comments. There are behind the scenes photos and video and even, in some cases, never before seen footage excised from the films. It is truly an enormous endeavor, and too much for me to take in in one sitting; I had to break it up over several nights. There is more information delivered than I ever thought possible about this series, and here’s the thing – it is all totally entertaining. I credit the editors who put this beast together with keeping it rolling and fast-paced. It never gets boring – which is amazing considering it’s over 6 hours long - 400 minutes of footage! And to top it all off, there’s even a commentary track for the entire documentary! Yep, that’s right – a commentary track that is, believe it or not, equally entertaining! It features the creators of the documentary discussing the trials and tribulations of creating this gigantic documentary. You can imagine how much work and coordination went behind this production, and the number of stories that were created in the process. 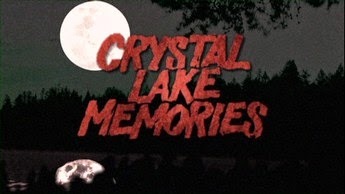 The folks responsible for Crystal Lake Memories, 1428 Films, are also the creators behind the amazing NEVER SLEEP AGAIN documentary on Freddy Krugar and the Nightmare on Elm Street series. 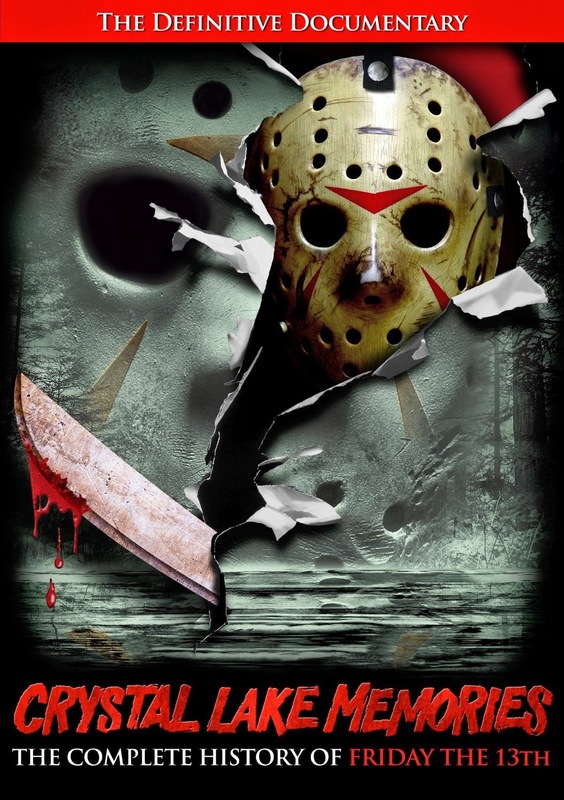 That is another massive documentary that follows the Freddy franchise film-by-film and is equally entertaining. It is on Netflix right now, and highly recommended! So check out CRYSTAL LAKE MEMORIES – available on DVD and BLU-RAY now. Definitely worth the price of admission – which ain’t that high! It sells for around $30 on Amazon right now for the Bluray, $18 for the DVD. You can’t beat that with a machete! They say all good things must come to an end- and if there’s one thing I’ve learned over the past few years it’s to enjoy the good things while they’re here, because they won’t last forever. So it is with much sadness that I bid a fond farewell to the RUE MORGUE PODCAST. It seems like only yesterday that I wrote a very similar post bidding farewell to the previous incarnation of this audio podcast, RUE MORGUE RADIO. THAT show was a variety show of interviews, reviews, commentary and music of all genres, all brilliantly woven together by the talented Tomb Dragomir, who I interviewed here. 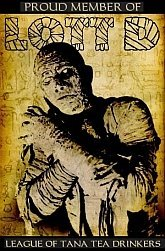 It was a fantastically popular podcast (and perennial Rondo Award Winner) that was ended for budgetary reasons by RUE MORGUE MAGAZINE in February of 2012. RMR was discontinued, but in its stead rose THE RUE MORGUE PODCAST. I wrote an article about the new RMpodcast here back in Feb of 2012. 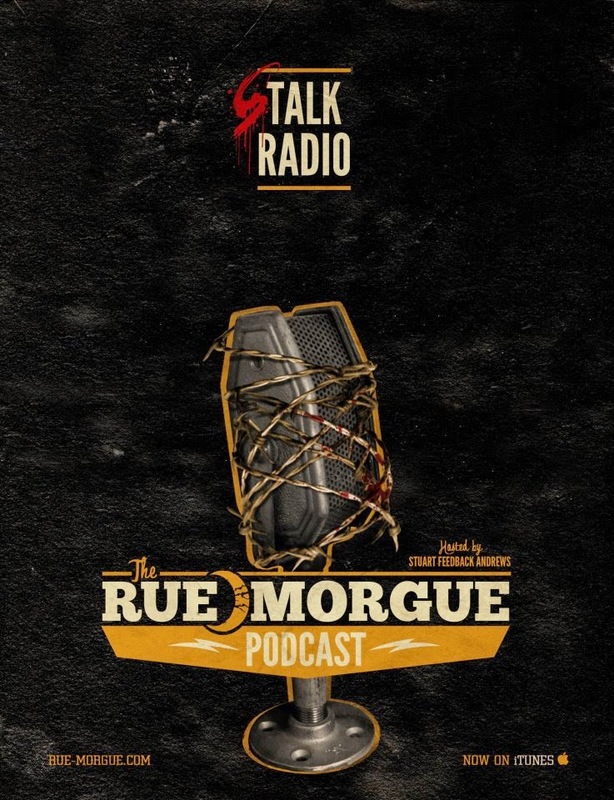 Hosted by Stuart Feedback Andrews (and occasionally side-kick Last Chance Lance), the Rue Morgue Podcast featured interviews with directors, actors, and artists from the horror community, as well as contests, commentaries, music and more. It was always entertaining and one I looked forward to regularly. Feedback's interviews were always interesting and insightful…and influential, as a horde of imitators follow in his footsteps. 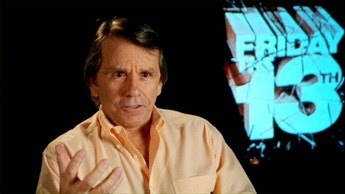 He was a true innovator of horror talk radio - and a true champion of Women In Horror Month, and I think his show played a big part in helping to spread WIHM's message. 169 episodes later Rue Morgue comes to an unfortunate end – but rather than end this post on a down note, I’d like to congratulate Feedback on the many hours of entertainment he’s provided, and the legacy he’s left behind. So to Feedback, and The Rue Morgue Podcast, I salute you. I hope you continue to produce more podcasts, Feedback - especially Cinephobia-radio, your side project/podcast of which I'm a big fan. 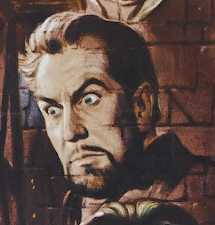 We're up to double digits on the Fantastic Films of Vincent Price now - in Episode 10 we take a look at the 1944 film The Keys of the Kingdom, where Price plays the part of Father Angus Mealey, an ambitious and arrogant Priest. Good movie that features an outstanding performance from Gregory Peck and Vincent Price as well as an early appearance from Roddy McDowell. Dr. Gangrene takes a look at one of Vincent Price's best non-horror pictures, the 1944 film-noir classic, LAURA. In this episode Dr. Gangrene looks at the1944 WWII drama THE EVE OF ST. MARK, where Vincent appears as a Shakespeare-spouting Southerner fighting the Japanese on an island in the Pacific.